It's Summer. There are outdoor concerts, plays, and marathons. And while I'm enjoying all these outdoor shenanigans, I want my buffalo chicken. Period. 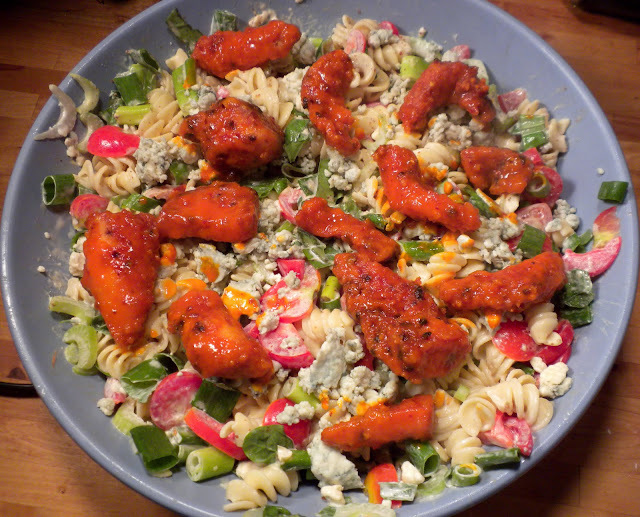 And this gorgonzola touched pasta salad with crunchy, spicy buffalo chicken and whatever leftover produce I had sitting in my fridge fits nicely in a tupperware container for where ever you go and whatever you do. I saw a version of this recipe on The Life and Love's of Grumpy's Honeybunch, and just had to give it a shot. So I decided to combine a bunch of recipes - the lime based buffalo sauce, the crunchy chicken from the General Tso Recipe, and the vinegary coating from the chicken salad. I wound up with dinner and lunch for three days, and I still wanted more! Adapted from The Life & Loves of Grumpy's Honeybunch. 1. Coat the chicken strips in the corn starch and let sit at room temp for 30 minutes. 2. 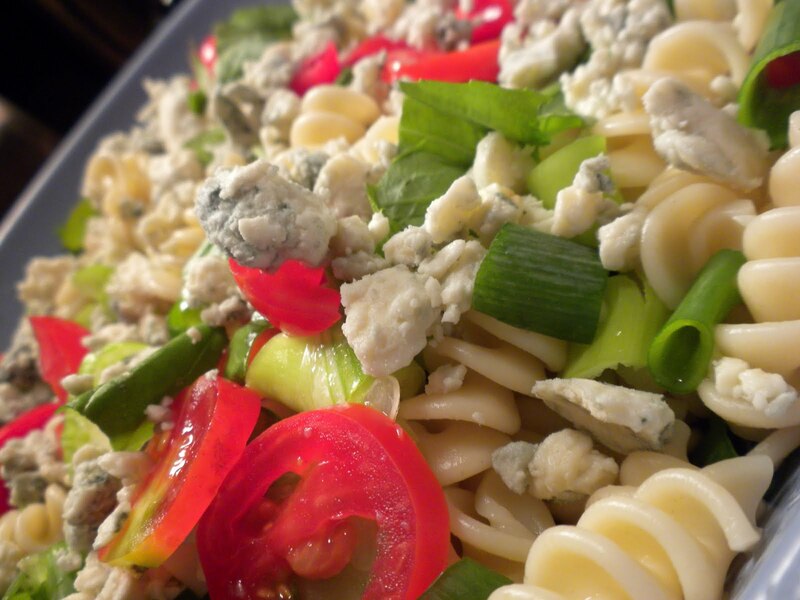 In a large bowl, combine the cooked pasta, scallions, fresh basil, celery, red pepper and gorgonzola. Mix well. 3. Add the mayonnaise, mustard, and half of the vinegar, and mix well. 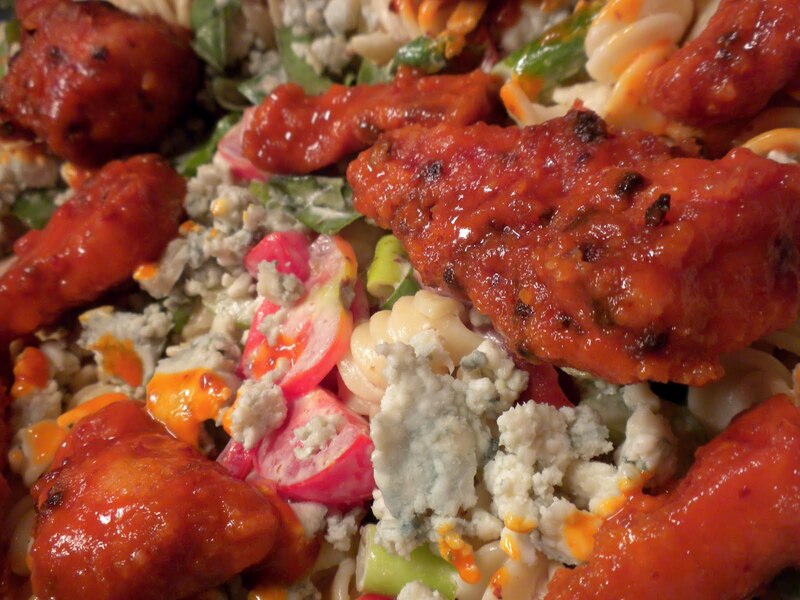 Toss it in the fridge to chill while making the chicken. 4. 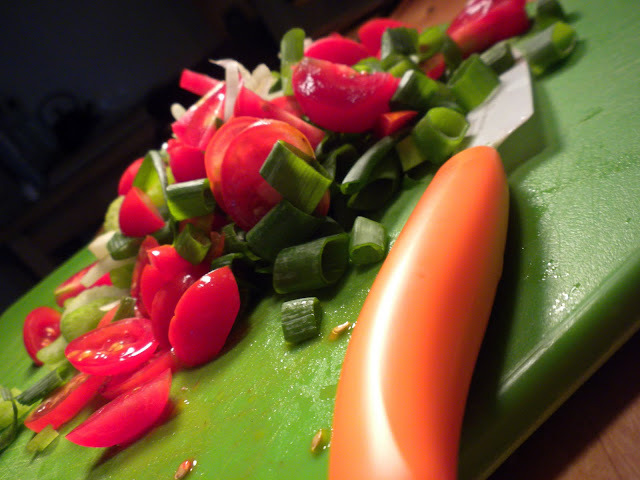 Add the chicken with a pair of tongs, and cook until browned and crispy - you may need to turn a few times. 8. 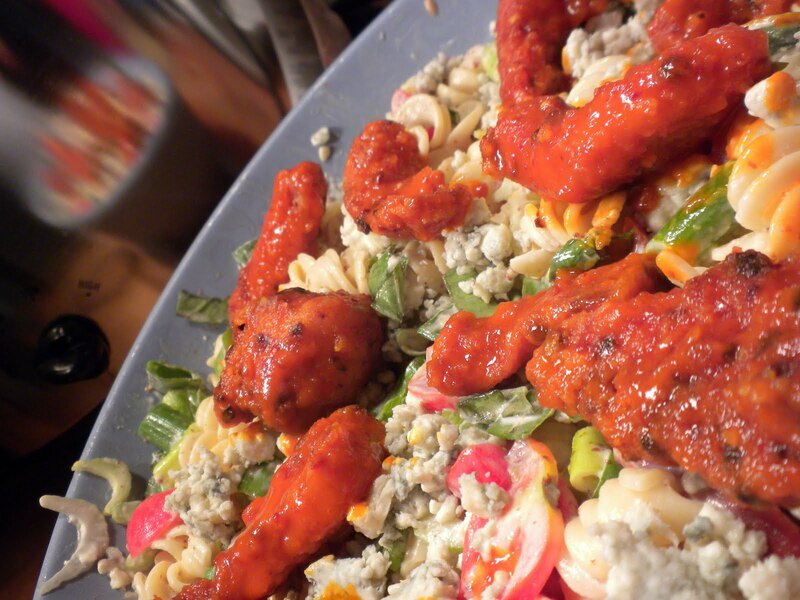 Remove the chicken from the mixture and place strategically on top of the pasta salad. I find it better on top rather than mixed in. I think you're onto something here...who doesn't want a meal to take on the go that's packed with delicious, satiating flavor? Thanks for sharing the recipe and the tip about placing the chicken on top of, rather than mixed in the salad. Either way, I'll bet it's tasty. Bravo!